Awwww, the last part that we're waiting for (the PSS dripless shaft seal from PYI in Seattle)…the one we thought would arrive yesterday, did not. And then it also didn't arrive today. Maybe they sent it via Fed Ex or UPS instead of expedited USPS as requested (which for some reason is way faster to AK than FedEx and UPS are, probably because FedEx and UPS both to to Anchorage first). Anyway, our new shaft seal is still not here. We were hoping to get back in the water on Monday, and I guess we maybe still can if the part comes first thing Monday morning. Fingers crossed! 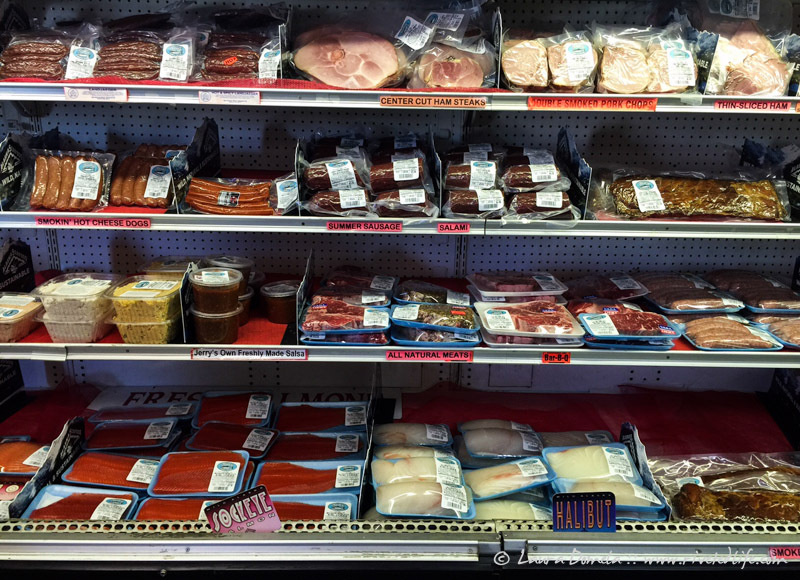 We ran a few errands this morning while we still had the use of Julie's car, and one of them was stopping by Jerry's Meats & Seafoods, around the corner from Western Auto & Marine. This place is great! When we had breakfast with Steve and Julie last weekend, they cooked up some delicious bacon from Jerry's (double smoked) so we got some of that, some smoked salmon and crab spread, some smoked halibut, some of Jerry's homemade salsa, and a small package of prosciutto. 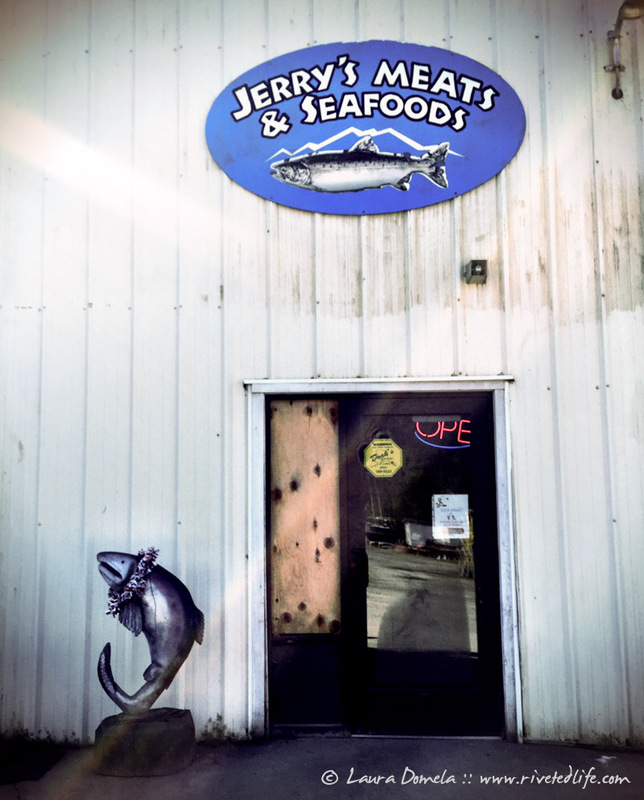 Jerry's also ships, and they have a great selection of Alaskan seafood. 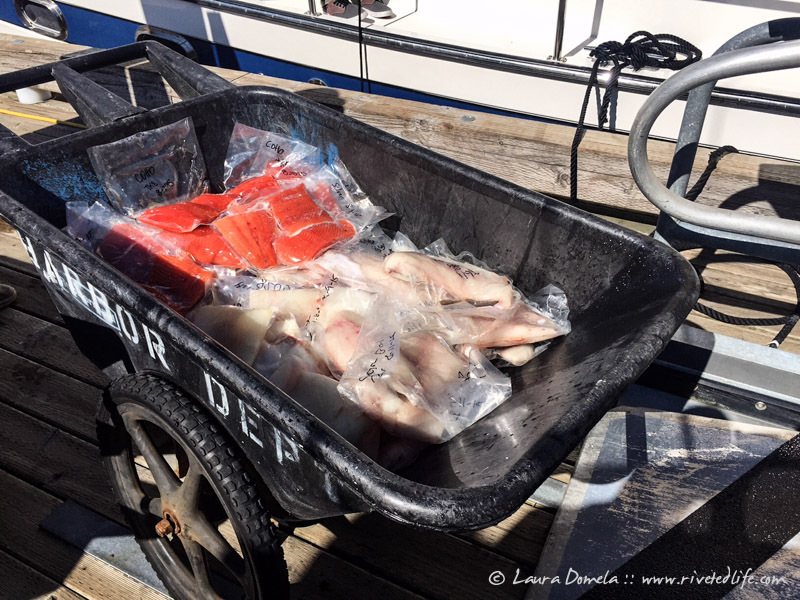 You can get 15 pounds of halibut and king salmon, in 1 to 1.5 pound bags, overnighted fro $385 (that includes shipping). That's just over $25/lb for Alaskan halibut and King salmon. Sweet! (This photo doesn't include all the Dungeness crab they also brought back.) Nice!